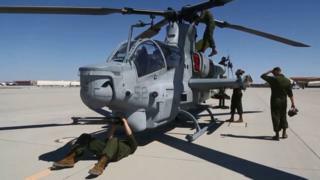 Two US Marine pilots were killed in a helicopter crash during a training exercise in Arizona, US officials have said. Their AH-1Z Viper helicopter went down near the Marine Corps Air Station in Yuma on Saturday around 20:45 local time (05:45 GMT Sunday). The pilots were taking part in a “routine training mission”, the Marines said in a news release. The cause of the crash is currently under investigation. Their mission was part of the “Weapons and Tactics Instructor course 2-19”, the Marines said on Sunday. The service members have not been publicly identified, pending family notifications. The base is located about 2 miles (3.2km) from Yuma, in the southeastern part of Arizona near the US-Mexico border. The 1,300 square mile facility (3,367 km/sq) is one of the largest military installations in the world, according to the Associated Press. In a tweet on Sunday, the Marines said: “Our condolences go out to the families and friends of our two pilots who we lost last night in Yuma”.